Well, the last 2 days have been interesting - but not always in a good way! On Sunday morning we were once again woken by the bell ringers - but not of the holy kind - our ringers were of the 4 legged variety🐄🐮🐄 and they were busy making their way to the cheese factory with their precious milk! And it was cold with puffy white clouds romping across the lake surface, and when we looked at our thermometer it was only registering a very cool 6 degrees. Also we could hear the wind howling, and as we peered out of windows, not only could we see bright blue skies, but we also noted that there had been a fresh scattering of snow on the surrounding mountain tops! But none of that slowed us down - today the Varney's (us) were going to be staying in Les Verney's which lies at the foot of the Col du Galibier, and to get there we had about 44 miles to travel - and once again our route was to be up hill and down dale, but we didn't want to arrive too late because our plan was to 🚴🚴 up the Col once we got there. 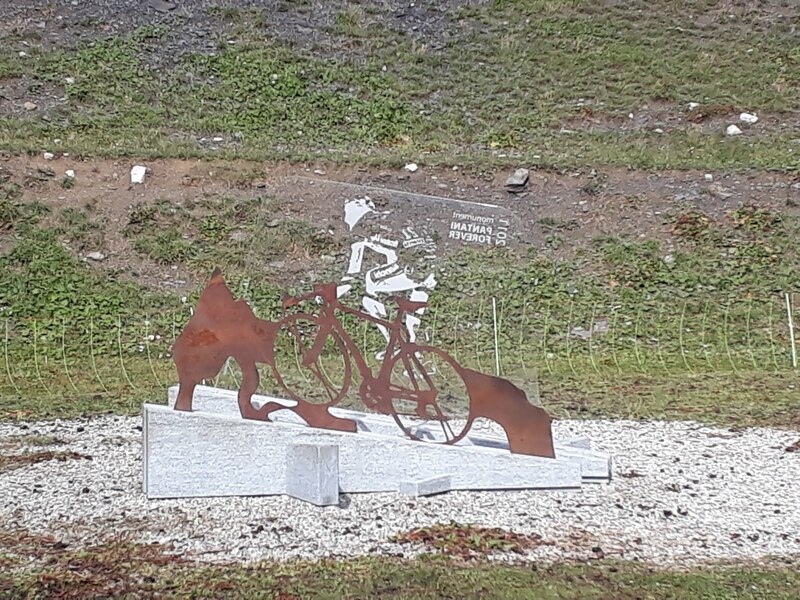 Our route took us back down the twisty D1006 to Lanselbourg where we found an Aire to attend to T4rdis2's ablutions, and then it was onto the D902 at St Michel de Maurienne, and from there we started our 6 mile climb up the Col du Telegraphe. In the past this mountain has been called 'The stepping Stone to a Giant' - in other words - the way to the Col du Galibier. Obviously, by now we were well and truly in 'Tour de France' territory and there was evidence of it everywhere. John and I have been fans for many years so to see memorabilia of it around every corner was quite enchanting for us. The Tour is said to be the biggest annual sporting event in the world - apparently a French journalist once said that the President might run the country for eleven months of the year, but in July France is ruled by 'The Tour' - a gruelling road race that started back in 1903. I suppose one day we might come and see it in the flesh - but to be honest I'm not sure if we'd enjoy it quite so much if we had to become one of the thousands of other spectators! 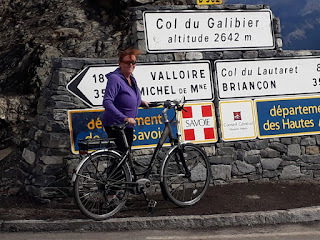 We paused at the top of the Col du Telegraphe (1566 metres) for coffee and a look around, and then we were soon zooming down the other side towards the town of Valloire and from there it was only a short 2 miles to our destination. However, when we arrived at the Aire we got a bit of a shock - the engine management computer told us TO SWITCH OFF THE ENGINE! Oh dear - that more or less meant we'd broken down way up in the Alps and miles from a proper garage. Now bare in mind we'd had T4rdis2 serviced 3 weeks ago just prior to our departure for this tour, but when John checked it seemed we'd almost ran out of oil - it was just staining the very tip of the dip stick - and we hadn't got any spare on board! Also as it was Sunday we knew there was little point in trying to get any because nearly all outlets in France close on the Sabbath! Therefore, as there was nothing we could do about it, we did as we were told - parked up and switched the engine off - and after that it wasn't going to be switched on again until we'd sorted the problem because that would have risked wrecking the mechanics of our van completely. 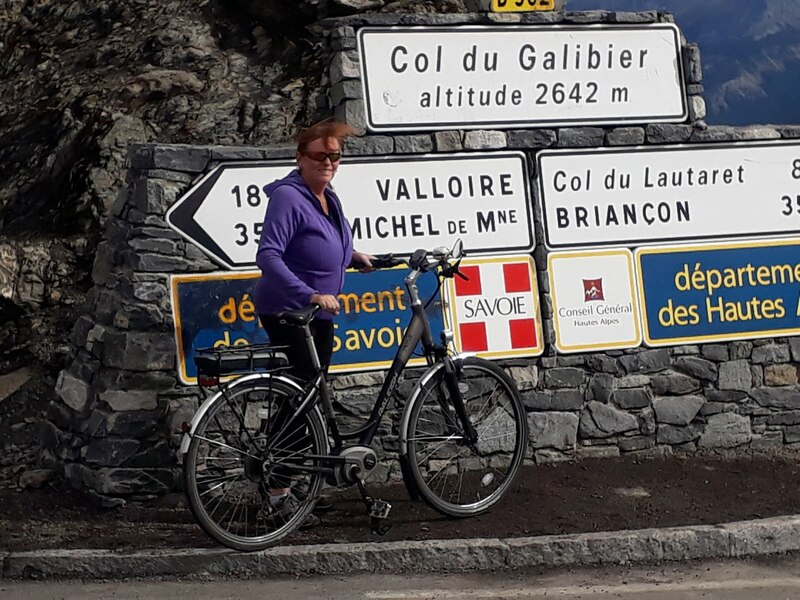 So we stuck to our original plan - had lunch and then set off on our bikes up the Col du Galibier - but that was another under-estimation! It was about 10 miles to the top which stands at an altitude of 2646 metres - and it's steep! When we set off the sun was shining warmly on us but we knew it would be colder coming down so we dutifully packed jackets and gloves for our return journey. With the help of our batteries we just about made it up without a break but it was really quite hard because for a lot of the way you can see whats coming next, and also for me, the height of the massive scree slopes that drop away vertically right at the side of the road caused a fair degree of fear - one wobble would be all it would take! And then you come to what you think will be the summit - but it's not! It's where the tunnel that takes motor vehicles through to the other side of the mountain is found - but it's closed to cyclists - they have to go up and over the top of the summit which adds nearly another mile of very steep road where we found little mounds of snow at it's sides. We did eventually make it to the top after about an 90 minutes hard peddling - but when I tried to get off my bike I found my legs would hardly support me and then came the cramp - it nearly brought 😭 to my eyes! Oh and did I mention the cold! We donned all the clothes we'd got with us and our return journey downhill only took 37 mins - but it was bloody freezing and we were both shivering by the time we got to the bottom! But despite that we took the time to explore 'The Straw Exhibition' which was right next to our camping spot! 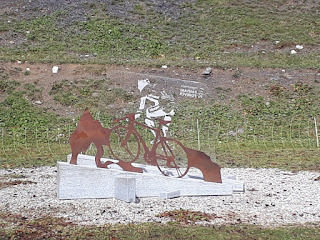 Then first thing on Monday morning we were on our bikes again and nipping down to the village of Valloire to try and get some oil from a garage I'd spotted yesterday. However, when we arrived we found it was just an unmanned filling station attached to a supermarket - therefore it seemed as if we were really in deep 💩💩💩! However, on the off chance I suggested to John that he should go in and ask the chap attending the till if he could help - and voila - he quickly returned clutching 2 litres of the the precious black gold! Therefore, it was quickly back to the Aire to resuscitate T4rdis2 and then we set off on another journey we thought would take us to a campsite at the foot of Alp d'Huez - but that turned out to be a right wild 🐧(couldn't find a goose) chase! 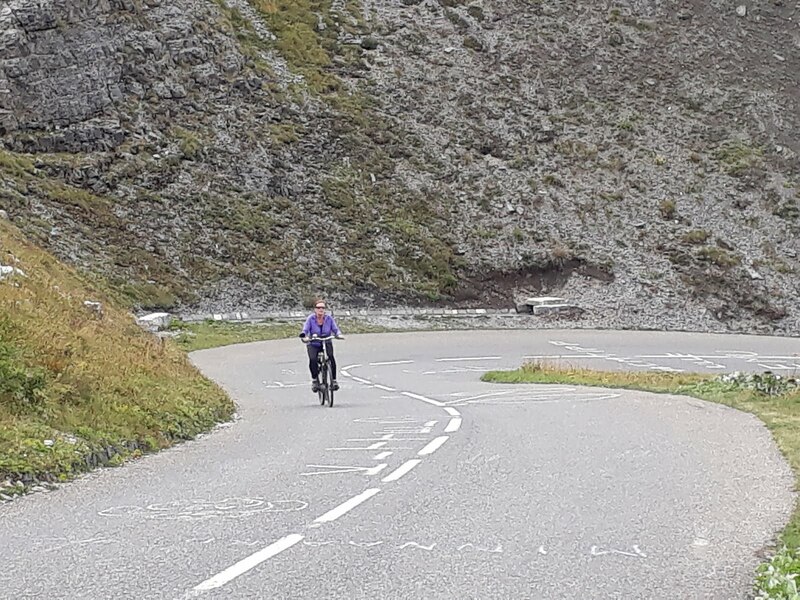 Our trek started with us re-ascending the Col du Galibier, and it was no less vertiguous in the van than it had been on our bikes, but this time instead of going right to the top we squeezed T4rdis2 though the tunnel! Then we didn't have far to go until we were on the slopes of the Col du Lautoret where we had superb views of the glaciers clinging to the rugged slopes of the Massif des Ecrins, and where we were passing along the Romanche valley on the D1091 towards the village of La Grave. But to get to La Grave we needed to go through 2 more long tunnels! The first was the longest and it's narrowness just required a prayer to ask that nothing would come the other way, and the 2nd, well that contained a lorry and a tarmac chewer which was ripping up the road ready for a new top layer to be laid - but we did just manage to squeeze by. 'Phew' we said 'glad that bit's over' - little did we know😂😂😂! We hadn't gone far into the village when a French chap in another motorhome flagged us down and 'seemed' to say we couldn't go in the direction we were headed - '😨Oh no😨' we said - so it was back though the tunnels for a second time! Then once we were clear of them John pulled over to look at his map and realised there was no other way for us to go if we wanted to get to our planned destination, and as lorries were coming from the direction we'd just tried we thought maybe we'd misunderstood the French gentleman - so we turned round and braved the tunnels for a third time! And we felt quite chuffed with ourselves as we travelled for about a mile out of the village of La Grave - that was until we came across a permanent road sign with a big red ring and Camper vans written in it's middle! The French chap was right - we couldn't go that way but we didn't really understand why until later. We checked online and it seems The Grand Tunnel du Chambon at the side of the Lac du Chambon was closed in 2015 due to structural problems and the alternative route has two narrow sections that are not suitable for heavy or wide vehicles - but it was a bit annoying that there'd been no indication that our way was blocked earlier! Anyway, there was no other choice other than to go back the way we'd come again, and at that stage I said to John 'never mind, you know the road so well now you could go through those tunnels blind-folded'! Unfortunately, the above meant we will have to make a huge detour and re-plan of the order we're going to do things in, and it also meant we'd got to retrace our steps at least as far back as Les Verney's where we'd parked on Sunday night - but that was a bit to far to go today. Therefore we've found a quiet spot under the shadow of the Glacier de Lautoret, and we were even treated to the French version of One man and his 3 dogs🐕🐕🐕 on the grassy scree slopes above us. This morning we opened our blinds and we were amazed to see a scattering of new snow almost at our level - and the temperature was only 2 degrees! 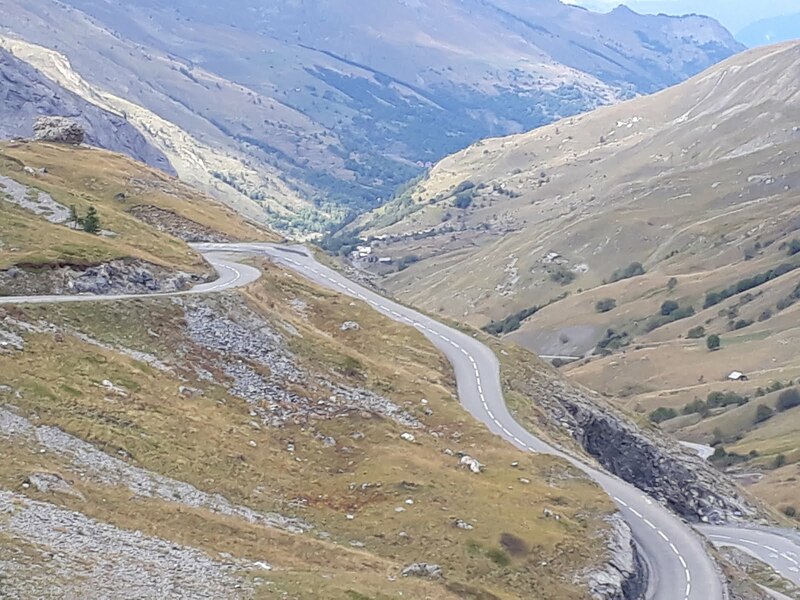 It all looked amazingly pretty in the sunshine but we were a bit worried because we knew we'd got to re-climb the south side of the Col du Galibier, and the roads there were very narrow. But we had no choice so we got ready and set off - but our wheels had only done a couple of revolutions when John got his first shock - he got bonked on the 👃 by a troll who fell off the shelf above his head - we usually remember to secure everything but this time our sneaky little mascot had escaped notice! Anyway, once Mr Troll had got his seat belt on we set off on our journey properly, and we very gingerly crept up the winding road, and all was well for the first couple of miles! But then as we rounded a blind bend with a very long drop on John's side we met a snow plough coming the other way! As you can imagine we both let out an expletive of fright and with our 💜s in our 💋we just about managed to squeeze past without our wheels tipping over the edge! Anyway, from there our journey to the top of the hill was without any further incidents but as we ascended the temperature dropped to zero and the mist swirled around us making us fear what was to come when we passed over the top! 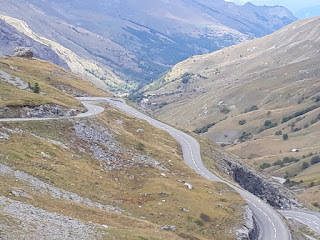 However we needn't have worried because once we'd passed through the tunnel to the north side of the mountain the weather became much clearer and as we descended on the slightly wider roads down towards Les Verney's the temperature started to rise. However, once we got to the bottom of the hill I realised we'd got to go much further back than I thought - now we had to retrace our steps over the Col du Telegraphe as well, and as we descended the other side we had 2 further near misses with big vehicles coming up that were taking more than their share of the road! I don't think John had realised quite how near we'd come to grief until he watched the video from his dash-cam - when he saw just how far they were over the white line he was cringing more that I did! Our retracing of steps went as far back as St Michel de Maurienne which was more than three quarters of today's journey, and from there we headed first to the nearest Lidl to restock, and then we continued on to the town of La Chambre from where we plan to ride up the Col du Glandon - but we're saving that pleasure for tomorrow. For today we satisfied ourselves with a walk out to explore the very pretty town, and we also felt compelled to enter the Beaufort Cheese Co-Operative which is just across the way form where we're parked. As we entered the whiff almost knocked us back, and the lady assistant seemed a bit surly, so as we weren't sure what we wanted to buy we left with nothing at all! However, having done a bit of research about Beaufort cheese - I will go back tomorrow and buy a petite piece! Apparently it takes 130 gallons of milk to make one 99 pound cheese, and then it has to age for 6 months in a mountain cellar. It is said that Beaufort is richer and creamer than most other mountain cheeses and it should have a scent of milk butter and honey - I'll let you know when we've tried it!